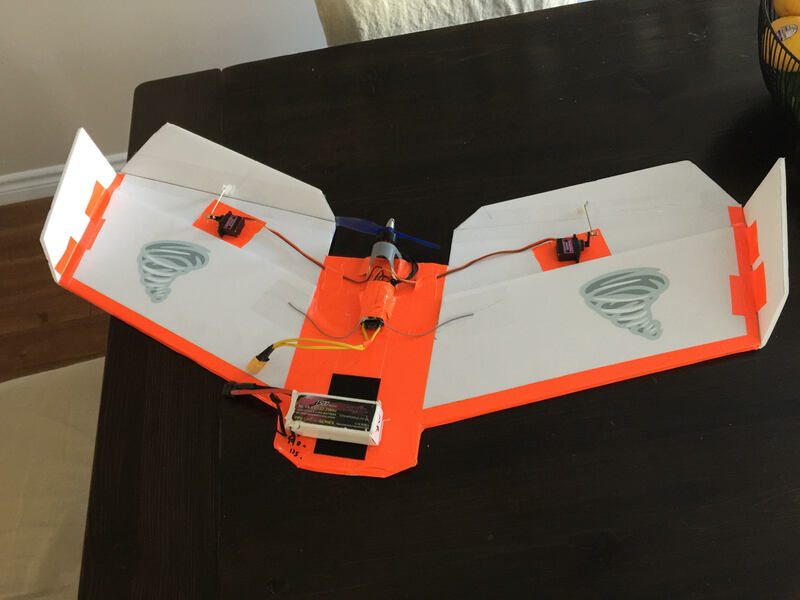 I've spent some time designing a wing that was really cheap to build, very strong, very stable and capable of flying slow, perfect for wing combat!. The motivation came from having a lot of friend transitioning from flying quads to wings, so they can do it pretty well, but they don't feel very confident flying LOS. I'm not sure how to Tile the pdf for printing, so I included dimensions from the edges so it's easy to trace on the foamboard. Cool looking design, I like the simplicity of it. It sounds like it would be a great combat plane just judging off of the efficiency of the power set up, being able to fly around 20% throttle is quite impressive. How long do you think you could keep it in the air for? Thanks! 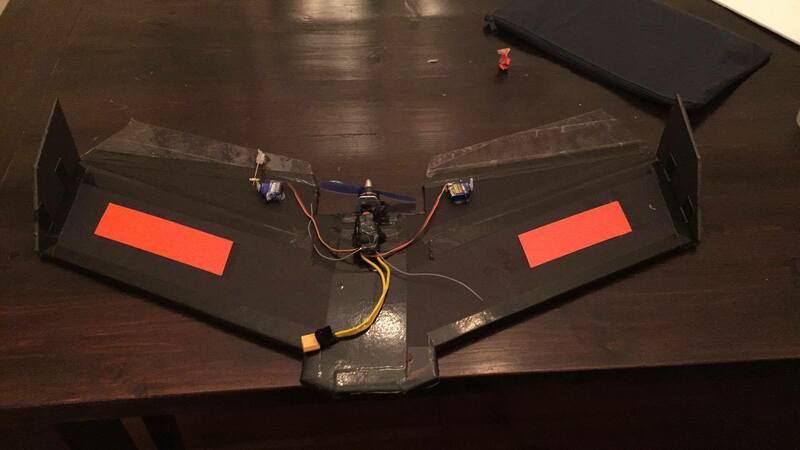 I'm very happy with how it flies. I'm hoping to get some flying footage soon (the snow is melting so all the flying spots are pure puddles right now). I've been running a very inefficient setup, because it's the one that I know my friends will have (racing quad people). 4s 1500mah is a lot heavier than I would suggest to use if efficiency is important. The ideal setup would be an 1806 motor and a 3s 1500mah. I feel this would give you a good balance between power and weight. With my setup I can do fun flying at 50% throttle for at least 15min (never pushed it longer than that, specially since I'm a bit of an aggressive flyer, I tend to fly on the 60-70% throttle). I would be curious to how long you could get out of a lighter setup. 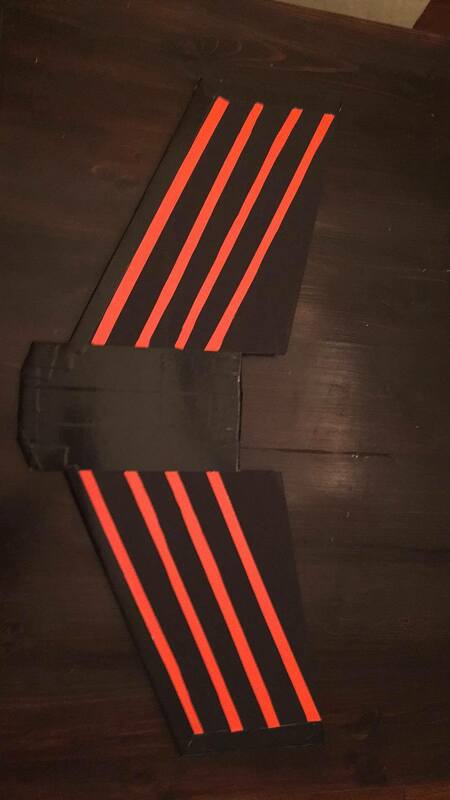 So I experimented with a new technique to put this wing together, I decided to build the lightest version I could by just changing the assembly process. So this time around I decided to not use any hotglue to put both top and bottom parts together, also I decided to use a very light type of duct tape to secure the leading edges together! (brand was ducktape). With all the electronics installed (minus battery) it came to 280g. The version using gorilla duct tape and hot glue to reinforce was 330g. I will be posting a flying video soon! I like your design! I am currently constructing one using 3/8" insulation foam. I had it on hand but no foam core at the present. I will post picts and video when it stops being windy, rainy or snowy or all three. Forecast looks favorable for the Central Ohio area. Thanks for sharing. This has been added to my build list. Thanks for including the measurements on the plans as I prefer to transfer it that way then printing. I would love to know how it turns out!! I'm from Canada and we don't get insulation that thin here, the thinner we can find is 1/2"
looking forward to seeing pictures and video! 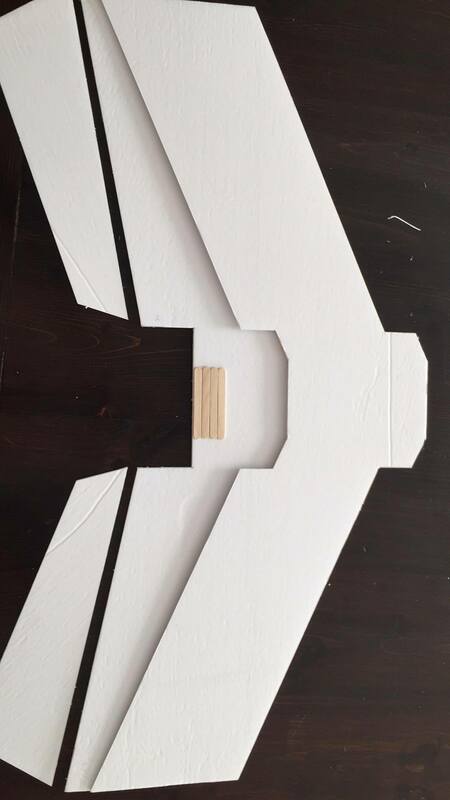 Yeah, I prefer this method too, I can see how it would be a lot of work if the design was complex but for this wing it's really worth using the measurements instead of printing. Was able to build most of it last night using the measurements, between chasing kids around. I used 1x5x200mm carbon fiber instead of popsicle to give it some extra strength they are set in from the leading edge and run parallel to it and cross each other in the center. I'm planning on building a swappable power pod area for the motor like the nacelle on the mini guinea that I have then I can swap my 1806 between the two. I believe I can build this using the scrap gets cutout from the prop area. I love the idea of the swappable power pod, I'm very interested in how and where it might fit. I would say the power setup is the one weak link of the design as there is no obvious motor mount to use. I personally 3-d printed myself a mount, but I know that most people would rather go for something tested and proven like the FT power pods. 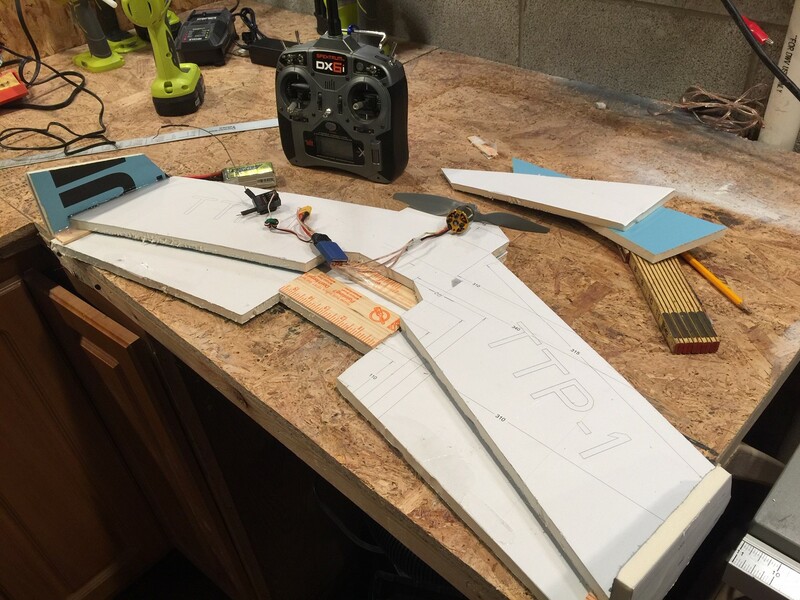 Last night I have the main part of the wing constructed fro 1/2" foam insulation. I am tossed between a 20 amp esc for a 2205 red bottom (prop TBD) or a 1000kv generic Chinese import motor with a 5" prop. The servos and the rest of the electronics hopefully installed tonight. I have a pict but will post later today. I need to weigh it to see if my guess for the motor is accurate. I am using paint sticks to reinforce the wing construction. I would go for the red bottom, but probably both options will give you a good flying experience. I am hoping that this will be durable enough for the FFOH19 Combat Flights. That is why I selected Paint sticks rather than Popsicle sticks. I was out of tongue depressor which would have been my first choice for weight and thickness. Still, a pretty good choice for durability, I hope. I am hoping that this will be durable enough for the FFOH19 Combat Flights. 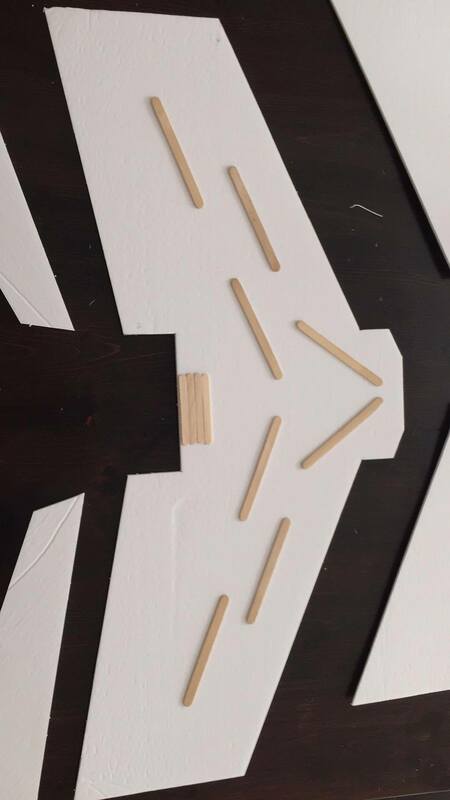 That is why I selected Paint sticks View attachment 127903 rather than Popsicle sticks. I was out of tongue depressor which would have been my first choice for weight and thickness. Still, a pretty good choice for durability, I hope. wow!! that foam looks quite thick!! I didn't realize 3/8 was that thick! I think I change my mind... 1000kv and potentially opening the motor bay a bit wider to accommodate a larger prop with higher pitch (6x5 ?). You want to make sure you can fly slow and fast to be successful at combat, the lower kv motor will help you do that considering you are going to be heavier than my foamboard one. I'm literally dying to see this thing fly. Since you have the material for it, I would try to round the leading edge with sand paper (or exacto). at that thickness it will make a difference in flying slow. My apologies. The foam is actually 1/2". I had planned to round the edges tonight and treat the edges with smoothed hot glue as well. I have considered covering with colored packing tape as well but at the cost of additional weight. After I weigh it I will be able to make a more educated motor and esc selection. Will keep you up to date. really eh? I was under the impression that slow turbulent air over the wing would make it stall quicker, the sheets I use are 5mm thick so I find that 10mm won't affect that so much the air flow. But on 20mm thickness like Captain Video has, I thought it would start making a difference. But maybe you have some insights that I don't Piotrosko, what would you recommend? oh yeah I see where you say that you used 1/2 instead of 3/8. Ok so now I'm even more interested in seeing how it works, because I can easily find 1/2" here in Toronto. and it will make for a far more durable wing! I found this thread, worth reading it... what I took out of it is that a very sharp leading edge is bad, a square leading edge creates a lot of drag. Maybe there is a happy middle ground?